A world without TB Innovation International 24 March 2016 Click here. Blood test shows if you will get TB Cape Times 23 March 2016 Click Here. Blood test can predict development of TB Eastern Province Herald, 25 March 2016 Click here. 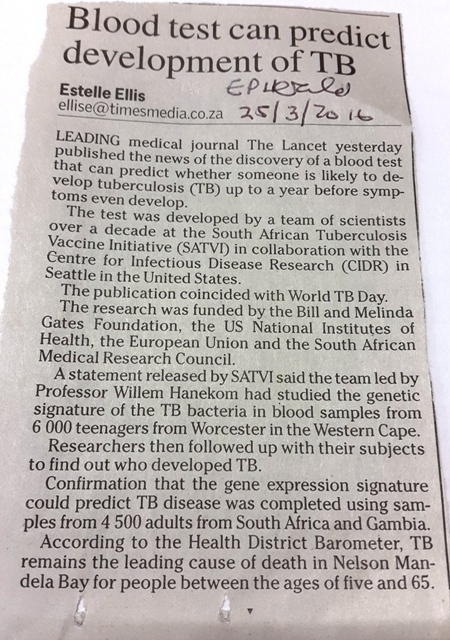 Landmark Tb study could have major impact Worcester Standard 28 March 2016 Click Here. Special World TB Day Newsletter Worcester Standard 24 March 2016 Click Here. Drama oor TB in Worcester Worcester Standard 14 March 2016 Click Here. Drama Sketch teaches about TB Worcester Standard 29 February 2016 Click here.